Ugly Overload: Your Monday.... ugdorable? 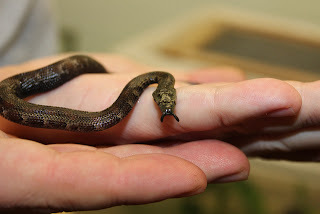 OK, even I am not sure about this one... That is a baby tentacled snake, resting on the hand of one of my sometime colleagues at the National Zoo. Tentacled snakes are aquatic (see some pictures of them in the water here) and spend their time hanging on by their tails to a branch and lolling about underwater looking uncannily like a dead branch. This clever method of disguise makes it easy for them to catch unsuspecting prey that swims by. Convenient for them, but less convenient for the keeper who is wondering how she would know if that dead-looking snake was actually dead.